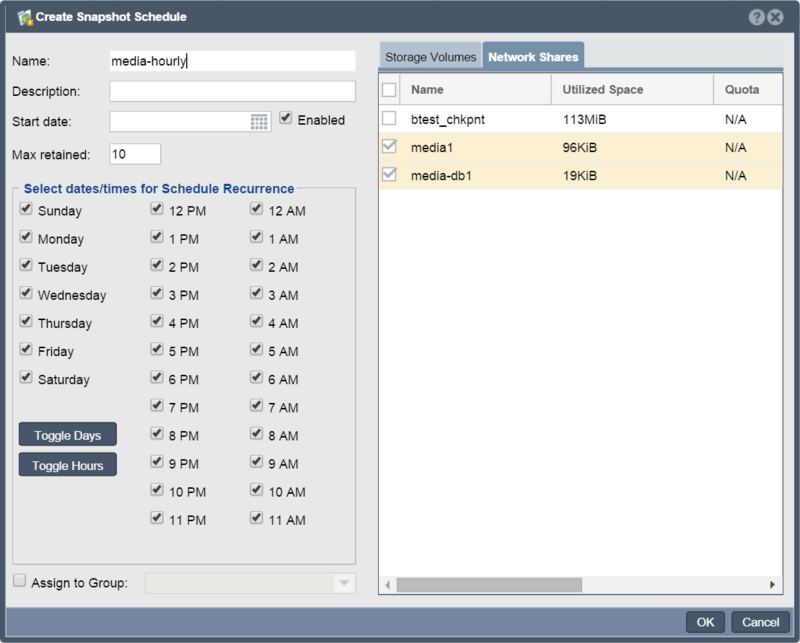 Snapshot schedules create a space efficient snapshots automatically on a schedule. Schedules may contain any number of Storage Volumes and Network Shares from any number of systems in a given storage grid. We recommend that a snapshot schedule be created for all mission critical storage volumes and network shares so that one has rollback ability in the event that a user deletes data or in the event that there's a security breach so that auditing and any necessary data recovery can be done using snapshots. Snapshots schedules automatically expire the oldest snapshot once the specified maximum retained snapshots setting has been reached. One may also configure multiple snapshot schedules with any number of Storage Volumes and Network Shares from any number of systems in a storage grid. Volumes and Shares may also be associated with multiple Snapshot Schedules each maintaining independent snapshot rotations. For storage volumes and network shares containing critical data one should create a Snapshot Schedule that will create snapshots at least once a day. A second schedule that creates weekly snapshots is also recommended. This page was last modified on 17 April 2019, at 07:52.